Unam Sanctam Catholicam: Our Lady of Emmitsburg? While in Emmitsburg last weekend, I happened to pick up the local newspaper, the Emmitsburg Dispatch, and was surprised to see the headline "Our Lady of Emmitsburg Silenced." As I read on, I found that something very reminiscent of Medjugorje (and other areas not so far from me) was going on in Emmitsburg. The article is much to long to transcribe, but you can see the original here. "I can tell you this: Even your governments and the Church authorities already have knowledge of the stars aligning and its implications upon you. You must not fear but must be prepared, primarily spiritually. After awhile, you will see a time when there is another body in orbit around your solar system, coming between Earth and the Sun and leading to tremendous devastation. Approximately 60-70% of the world’s population, as you know it, will cease. Of those who survive, 60% of them could die of disease and starvation" (source). She also claims on the authority of Jesus Himself that the Holy Family sojourned in Cairo during their stay in Egypt when Cairo wasn't even founded until 969 AD. What foolishness! This fiasco went all the way up to the CDF, where then Cardinal Ratizinger issued a declaration of constat de non supernaturalitate in February of 2003 (document here). Sullivan has been ordered to stop having the prayer meetings on archdiocesan property (Baltimore), which she was obedient to. However, confronted with Rome's conclusion, Sullivan arrogantly stated in 2006 that Rome had never in fact condemned the apparitions, and had a special apparition in March 2006 to confirm that her visions were in fact real. Isn't that convenient! "Recent messages and activity by those who support Mrs. Talone-Sullivan have created confusion among many and division in our parishes and our Archdiocese. On more than one occasion, the Archdiocese of Baltimore has conducted investigations into these matters in an effort to protect the faith and good morals of the Christian faithful. Each investigation has concluded that there is nothing of significance to be found in the messages and locutions... I also strongly caution Mrs. Gianna Talone-Sullivan not to communicate in any manner whatsoever, written or spoken, electronic or printed, personally or through another in any church, public oratory, chapel or any other place or locale, public or private, within the jurisdiction of the Archdiocese of Baltimore any information of any type related to or containing messages or locutions allegedly received from the Virgin Mother of God...Further, I strongly caution those who participate in any activity surrounding these alleged apparitions or who seek to disseminate information and promote them here in the Archdiocese. To do so is a great disservice to the Church and creates further confusion and division among the faithful." Now, how did Mrs. Talone-Sullivan respond? While grateful for the clarifications, she seems to shrug her shoulders at the possibility that she is being disobedient: "All of my priests spiritual advisors and canon lawyers that I have consulted have told me that I am obedient, and that the Church says what it means and would have specified differently if it meant otherwise. So we continue to hold this prayer meeting monthly, open to the public, at the Lynfield Complex in Frederick, MD. All are welcome! If you desire something different, please let me know." So, everybody tells her she is obedient, and so she insists. The Bishop cautions her against communication in "any matter whatsoever" within the Diocese, whether or not it is on Church property. 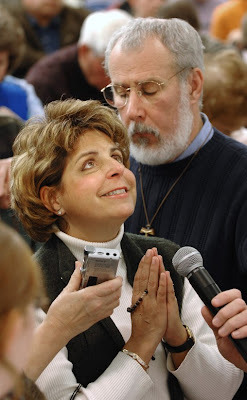 Mrs. Talone-Sullivan has at least been outwardly complicit: she has canceled the prayer meetings until further notice and urged obedience to the bishops. However, it seems that her obedience is only on the surface, for we notice that she has not stated that she will not speak or teach about these apparitions anymore, and that her Foundation of the Sorrowful and Immaculate Heart of Mary has changed its address from Emmitsburg, within the Baltimore Archdiocese, to Fairfield, PA, within the Diocese of Harrison. She seems to be setting herself up to continue her teaching outside of the jurisdiction of the Archbishop of Baltimore, technically complying with his letter but utterly ignoring its spirit. For me, if the Vatican declares your apparition constat de non supernaturalitate, that should be the end of it. Period. You should not be able to find any haven in any diocese where you can disseminate your visions, nor should you yourself continue to insist on their authenticity. All of the great spiritual writers who touched on the subject of visions have stated that the default position one should take is one of doubt, even the person having the vision. Let God prove its authenticity, and in the meantime, test it critically. What if the Vatican were to declare constant de non supernaturalitate with regards to Medjugorje, and the local bishop was to forbid any dissemination of the messages of Medjurgoje, public or private, in any manner whatsoever (which I believe he already has)? If this lady doesn't look lke she's going to stop, then believe me, such a thing would not stop the Medjugorjists either. At least it would clear the lines a bit, but the audacity of these people continues to amaze me. They get condemned and censured left and right and continue to maintain that they are in good standing with the Church. I guess when all else fails, just lie. Thought that the article was pretty good until the author went off track and brought in Obama. I don't back the latter on much but the last paragraph or two are ridiculously off track.